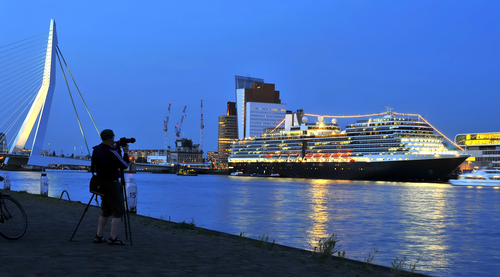 When is the best time to Cruise Europe? One of the most popular questions we get here is “when should we Cruise Europe?” That is a good yet complex question to answer. The first item you want to take care of is to decide where in Europe would you like to go? May to October is the peak season for cruising in Europe, when the weather is nice and the days are long. There are beautiful gardens in bloom and bustling parks to stroll through. You can dine alfresco or visit one of the many street fairs. The crowds may be larger during the summer but the weather is pleasant and the days are long. Remember that if you are going on a cruise in northern Europe, the days will be much longer; up to 20 hours in some parts of Scandinavia. Christmas time river cruises are an entirely different experience than a summer cruise. Holiday decorated markets brighten the crisp air, and there is always the possibility of a blanket of white when you wake up in port. If you like your vacations filled with amazing shopping, snuggling by the hearth and eating local foods, then a Christmas river Cruise may just be your ticket. Spring and fall can sometimes provide the best value in cruising and are great times to take a Mediterranean or Greek Isles Cruise. Warm temperatures during the day and mild evenings allow you to enjoy both the ports of call as well as evenings out on the ship. These milder months also allow you to take advantage of the days at sea, either lounging poolside, or just getting some sun. Whatever time of year you decide to take your European Cruise be sure to weigh out all your options and feel free to ask a cruise expert, they will be more than happy to assist you in finding the best location and time of year for your cruise. Hello and Happy Holidays from Destination Oceans. The holidays are a popular time for people to spend time with friends and family, AND CRUISE. Christmas time cruises are usually booked early in the year and fill up fast. I suppose sitting poolside and sipping eggnog or a martini does sound promising while the rest of us shovel, travel and bustle ourselves through the holidays. Imagine not having to plan any meals, listen to stories from your crazy uncle or clean up dirty dishes. The holidays should be a time of relaxation and enjoyment, what better way to relax than to let yourself be pampered by the cruise lines. Below are a few tips for booking and traveling during the holidays. -Book Early. With schools on vacation, many families want to take advantage of this much needed break and spend time together. -Check Airfare Prices. Air travel during the holidays can be notoriously expensive. Even though you have gotten a deal on your cruise, make sure you can afford the airfare for your Christmas Cruise. Many companies offer package deals that include airfare for your cruise. -Pack accordingly. You may want to bring special holiday outfits for Christmas and New Years Eve. Some cruisers have been known to decorate their cabins with wreaths, small fake Christmas trees and even electric lights and menorahs (no candles in the cabin, sorry). -Take time out for you! A Christmas cruise is a perfect time to splurge on yourself and recharge your batteries for the coming year. Get a massage, enjoy some in port dining, or just lounge around the pool and read a good book. The holidays are just another great time to enjoy a cruise. Whether it is a warm Mediterranean getaway, or a Christmas time cruise through Austria, take the stress out of the holidays with a cruise from Destination Oceans. 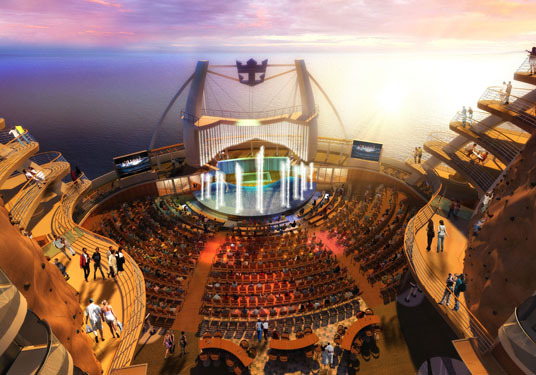 By now most everyone in the cruise industry has heard about and or seen Royal Caribbeans new colossal ship, The Oasis. The largest cruise ship in the world sits 16 stories above the water and if it was stood on it’s end, would be taller than the Chrysler building! A custom made $75 million port was built in Fort Lauderdale to accommodate it and multiple ports in the Caribbean had to be modified. The ship is a true modern marvel, comprised of 7 “neighborhoods” it houses 37 bars and restaurants spread over 16 levels. Of course the ship has the now pre-requisite four pools and 10 whirlpools, a rock-climbing wall, a basketball court, a miniature golf course, an ice skating rink, a shopping promenade, a fairground carousel, a central park with 12,000 live plants and trees, and a 1,380-seat theater, that we have all become accustomed to find on today’s modern mega liners. So when does this trend end? How big will these ships get? Perhaps the next ship will have a football field or a Nascar track? Cruise Deals NOT on the Oasis!